McGovern neuroscientists work with subjects of all ages and backgrounds. This page provides general information for prospective volunteers for brain imaging experiments at MIT. Additional information on specific studies will be provided by the researchers conducting the study. Research subjects receive financial compensation for participating in studies. Please join our study mailing list for opportunities to participate in behavioral and brain imaging studies at the McGovern Institute. Please note that studies conducted at MIT are for research purposes only. Research scans are not a substitute for clinical diagnostic tests, and we cannot provide clinical advice to research subjects. Where do brain imaging studies take place at MIT? All brain imaging studies at MIT take place at the Athinoula A. Martinos Imaging Center, located at the McGovern Institute for Brain Research at MIT. The entrance to the center is at the intersection of Main Street and Albany Street, Cambridge, MA 02139. When you arrive for a study, please wait in the lobby immediately inside the entrance and your researcher will meet you there. How can I participate in a study? Studies are advertised on this mailing list. You can sign up to the list and receive emails advertising ongoing studies. We work with subjects of all ages and backgrounds, and eligibility criteria are stated for every study. Many studies require subjects of a specific age, gender, or handedness, and some may specify attributes such as native language, ethnic origin, or other demographic factors. What should I expect during my visit to MIT? When you arrive at MIT, your researcher will greet you and discuss the study with you in more detail. Your researcher will also ask for your informed consent to participate in the study. In accordance with federal regulations, MIT policy requires that all research subjects must give written consent before participating in any research study. The consent documents will explain the purpose of the study, the potential risks, and the ways in which the data may be used. Volunteers will have an opportunity to discuss the consent form with the researchers and to ask any questions before deciding whether to give their consent. When the study ends, the researcher will provide you with the agreed upon compensation. Compensation varies across studies. Overall, the length of your visit will vary depending on the study you participate in, and this information will be communicated to you in advance by your researcher. Will my information be kept private? The privacy of volunteer subjects is an important concern, and research at the center is conducted in compliance with HIPAA regulations that govern the privacy of research volunteers. No private health information is stored within the imaging center. When subjects are scanned, they are assigned an ID number, and this number alone is used to identify their scan data. No other identifying data are attached to the scan files. The code that matches the ID number to the subject’s identities is stored only in print, not electronically, and the print records are securely stored by the individual researchers. Is it safe to participate in an MRI study? The magnetic resonance imaging (MRI) procedures performed at MIT are considered safe for most people, provided they do not have any metal implants other than dental fillings. All subjects are screened before the study begins and a metal detector is used before entering the scanner. MRI scanners produce powerful magnetic fields that exert strong forces on any ferrous metal object. Therefore, no metal objects are allowed to enter the scanning area. Prior to the study, you will be asked to remove items of clothing with metal attachments, and hospital-style gowns will be provided instead. You will also be asked to remove metal jewelry, including body piercings. We recommend that you avoid wearing eye shadow and mascara, since some types contain materials that can interact with the magnetic field. Some people may experience discomfort in the narrow space within the MRI machine, especially given the need to lie still for extended periods of time. The scanner can also produce loud noises during operation, which some people may find alarming. We will provide you with hearing protection in the form of ear plugs to reduce noise exposure during the scan to prevent potential hearing loss. Is it safe to participate in an EEG or MEG study? Electroencephalography (EEG) and magnetoencephalography (MEG) are passive recording methods that do not involve exposing subjects to any external electrical or magnetic fields, or to unusual noise levels. There are no known hazards associated with either EEG or MEG. What should I expect during an MRI study? When you participate in a study involving an MRI scan, you will lie on a horizontal table that slides into the scanner. Your head will rest in a support frame to reduce head movement. Many studies involve performing tasks while inside the scanner, typically responding to visual stimuli that are projected via a mirror mounted over the support frame. There is a 2-way intercom system that allows you to communicate with researcher when needed. Most people do not experience discomfort during the scan, but an emergency squeeze alarm is provided. If you activate the squeeze alarm, the researcher will immediately stop the experiment and bring you out of the scanner. What should I expect during an EEG study? EEG is normally performed in the upright seated position and does not require confinement inside a machine. Prior to starting the experiment there is a setup period of about 30 minutes during which the recording electrodes will be fitted to your scalp. A saline-containing gel is used to facilitate electrical contact. This gel is messy but harmless, and is washed away at the end of the experiment (washing facilities are provided within the imaging center). Most EEG experiments are performed within a soundproof booth, from which you can communicate with the researchers via an audio/video link. You can learn more about volunteering for EEG studies here. What should I expect during an MEG study? MEG is normally performed in the upright seated position. The MEG scanner is housed inside a special magnetically shielded room, with a heavy door similar in appearance to a bank vault. This is done to block external magnetic fields that would otherwise interfere with the very sensitive scanning procedure. Prior to entering the shielded room, you will be asked to remove metal items that can interfere with the recording, and they may also be demagnetized with a wand that resembles an airport scanner. Inside the room, you can communicate with the experimenter via a CCTV link. For some studies an experimenter may accompany you inside the room. How can I prepare for a study? Because our scanning facilities are heavily booked, it is very important to arrive at the appointed time. If you need to cancel, please inform the researcher of your study as soon as possible, so that the scanning time slot can be reallocated to another research study. Studies vary in length and tasks. Your researcher will communicate in advance how long your visit will last, and what kinds of tasks you will be asked to perform. For example, some studies require completing behavioral tasks in front of a computer screen in addition to the brain imaging session. On the day of the study, we recommend that you wear layers, as the temperature of the imaging facility cannot be adjusted. For EEG studies that involve fitting the recording electrodes to the scalp, we recommend clothes that can be removed without being pulled over the head (e.g., cardigan or sweatshirt with zipper). If you have any questions or concerns regarding your participation in a study, be sure to contact your researcher in advance to the day of the study. What should I expect when my child participates in a study? 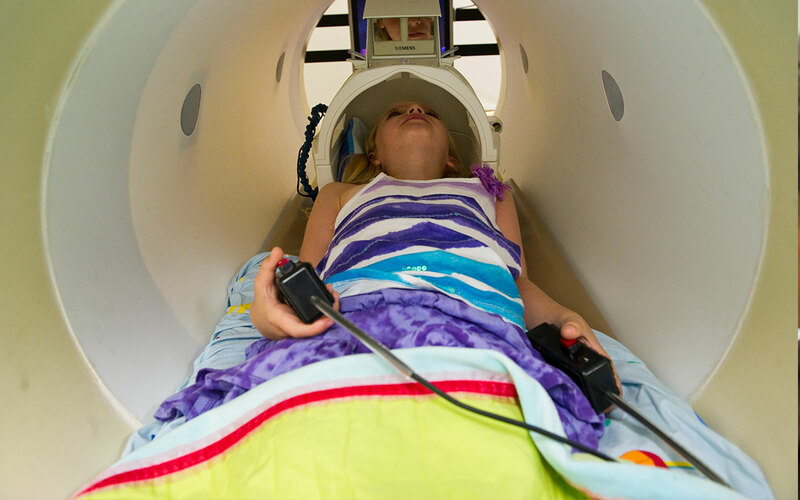 The neuroimaging procedures used at MIT are considered safe for young children as well as adults. During an MRI study, you will normally remain in the control room with a full view of the scanner. You will see your child but not vice versa. Your child will be accompanied by a researcher while in the scanning room. For some studies, your child may first practice the scanning procedure in the mock scanner, a full-size model that simulates the appearance and sounds of the real scanner. This allows children to become more comfortable in the scanning environment, and to practice any tasks that they may be asked to perform in the real scanner. During an EEG study, your child will sit inside the recording booth, with an audio/video connection to you and the researchers outside. Young children may be accompanied by a researcher inside the booth. We strive to provide a comfortable and relaxing environment for our young subjects and their families. A play area is provided and at the end of the session your child will also receive a picture of his/her own brain.